The hooves should be completely covered with feather hair. The look of a Gypsy’s Vanner horse should be the look of a small Shire with more feather and a sweeter (more refined) head. Short back in proportion to overall body. 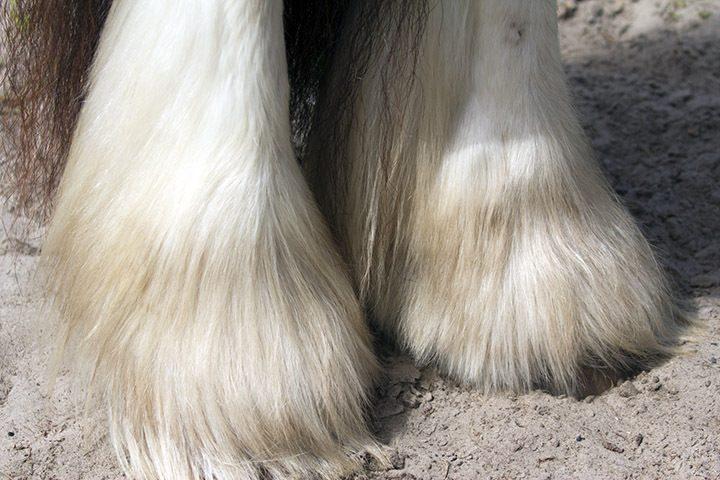 Heavy flat bone (flat at the knee) with ample hooves. Flat at the knees. 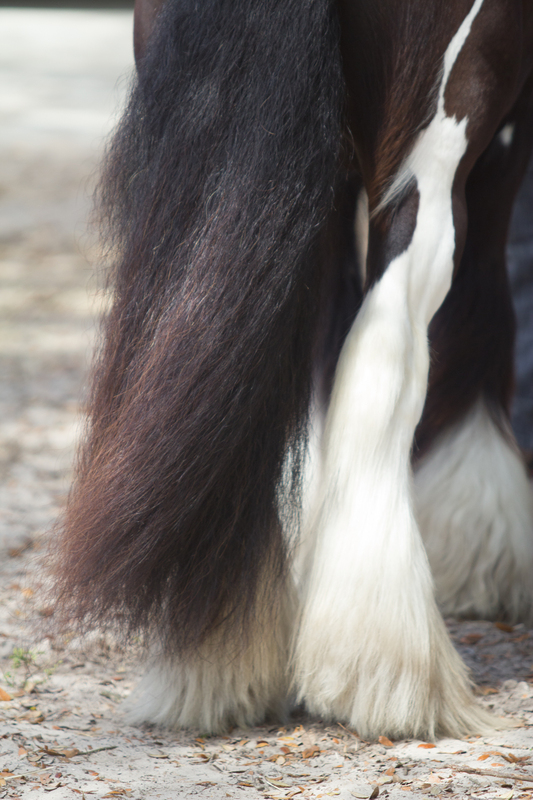 Hair: feather beginning at the knees in front and at or near the hocks in the rear that extends over the front of the hooves, ample to abundant mane and tail. Ideal hair is straight & silky. A sweet head with a strong neck in harmony with the horse’s overall look: A sweet head is more refined than a Shire. Disposition: The horse should exhibit traits of intelligence, kindness and docility. The points of the breed standard should be apparent whether the Vanner is Cart size (Mini 13.3hh and under), a Classic size (14hh – 15hh), or Grand size (15.1hh or over). When asked to critique the original standard, Helmut Lekschas, said, “I like how simple it is.” He then added, “Breed registries have a tendency to over complicate standards and that’s what gets breeds into trouble, just paint any judge a picture and they can judge your breed, all judges know faults.” —Helmet Lekscha, International horse breed judge. KISS is an acronym for “Keep it simple, stupid” as a design principle noted by the U.S. Navy in 1960. The KISS principle states that most systems work best if they are kept simple, rather than made complicated; therefore simplicity should be a key goal in design and unnecessary complexity should be avoided. The phrase has been associated with aircraft engineer Kelly Johnson (1910–1990). At Gypsy Gold we believe in the KISS principle. We believe expanded definition can be achieved without forsaking the simple and original words of British Gypsies. What can you do with Vanners? The Gypsy Vanner Horse is surprisingly athletic, smart, willing and retains what it learns very well. In addition, the Vanner has an almost unflappable demeanor. The combination of ability, brains and calm make the Vanner a candidate for any number of equestrian pursuits such as driving, English and western riding, jumping, pleasure and trail. The number one tandem driving team in North America for 2001 were two of the first 16 horses imported by Gypsy Gold named Jasmine and Esmerelda, now owned by WR Ranch of Oxford, Florida. History is being written every day that attests to the versatility and talent of the amazing Gypsy Vanner horses. Read “Five Non-Traditional Breed Horses Who Are Rocking It at Upper Level Dressage”, by Morgane Schmidt in Horse Nation. What is the Vanner’s temperament like? 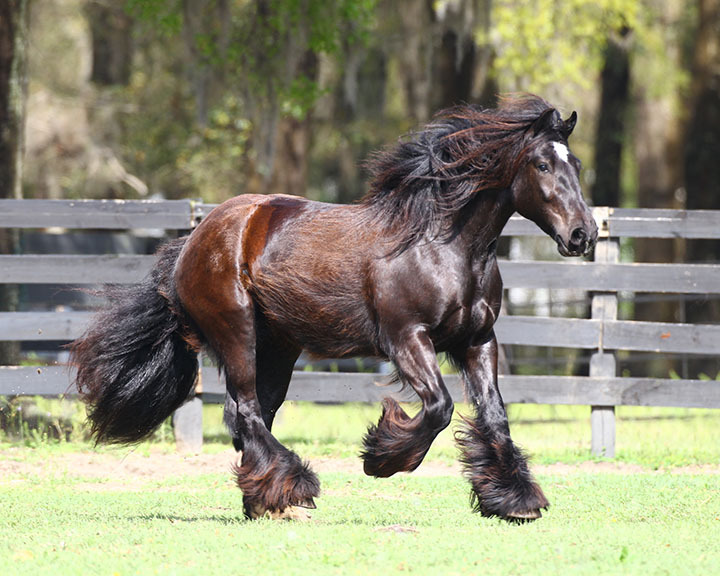 The feathers and abundant hair are trademarks of the Gypsy Vanner Horse. Cindy Thompson often compared the Vanner to a companion animal because they want to please and be with people so much. Dennis Thompson, inspired by the Vanner’s personality, coined the phrase “A Golden Retriever with hooves.” Dennis and Cindy believe that the Vanner’s innate kindness could well be attributed to feather and environment. Concerning feather: All horses with feature evolved from a prehistoric easygoing, hairy legged horse that lived in the forests of Europe called The Forest Horse. Feather (hair) being a recessive gene is also called an additive or cumulative gene. To develop a horse breed with more feather than any other horse required that British Gypsies only use breeds with feather, all evolving from The Forest Horse. One can therefore theorize that feather holds a genetic key to the Vanner breed’s easygoing Forest Horse, cold blooded personality. All cold blooded horses evolved from The Forest Horse. 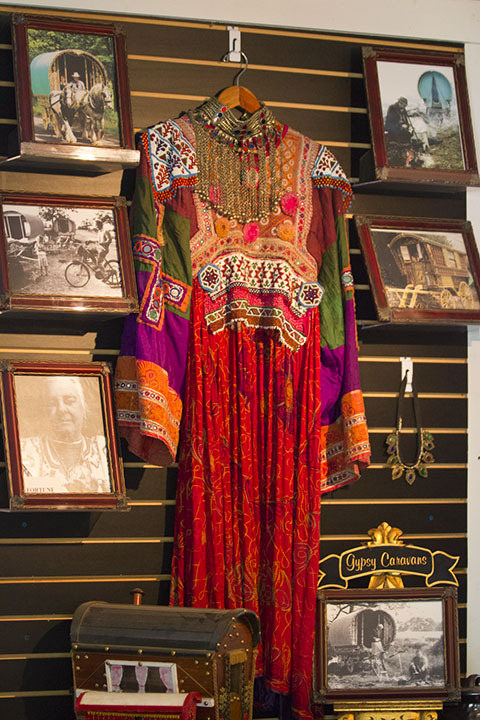 Concerning environment: Gypsies maintain very close family ties, often traveling with extended family for life. The children or grandchildren typically tend to the family’s prized horses. Often tethered on 30 foot chains with seat belts around their necks, they are moved daily. If an ill tempered horse endangers the life of a child, it will be culled and in today’s world, wind up for sale on the Internet. In conclusion, breeding for feather and unique social management has created one of the most gentle horse breeds in the world. It is common for a Gypsy mother to tell her children to stop bothering the horses as they crawl over and under them. Do Vanners come in all colors? Yes and no, the Vanner is not a color breed; it is a body type. Piebald (black and white) and skewbald (brown and white), Odd Colored (any other color and white) and Blagdon (a solid color with a white splash) or Splash Blagdon (a solid color with heavy white splash) are primary colors, but any color is accepted as long as the seven points that define the Vanner breed are present (see breed standard above). To achieve exotic colors, someone has stepped away from primary genetics and this explains why you sometimes see a reduction in breed character with more exotic colors, often less feather, lighter bone or a more common head. Some of the breeds most famous sires and dams are black. Black comes two ways: it is either fading or non-fading black and British Gypsies believe the black ones are more likely to throw deeper (non-fading) black and white babies. At Gypsy Gold, we have a special mare named GG Diamond Girl who is both fading and non-fading black, making her a very rare, black on black. A British Gypsy and Gypsy Gold will always choose body type over icing/color. Are blue eyes OK in the Vanner breed? Yes, blue eyes are fine, Irish Gypsies prefer blue eyes thinking that blue eyed horses will produce more color in their babies. 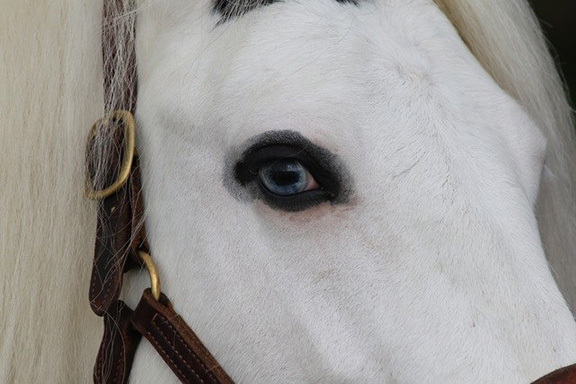 English Gypsies are not as enamored with blue eyes, but would never reject a blue eyed horse as long as the rest of the horse fits their vision of the perfect caravan horse. There were three size classifications for the Vanner breed originally and there will always be at Gypsy Gold. The ‘Classic’ Vanner is from 13.2 to 15 hands tall, the ‘Mini’ Vanner is 13.3 hands and under and the ‘Grand’ Vanner is 15.1 hands and over. All sizes should have the look of a small Shire with more feather, more color and a sweeter head. The Classic Vanner is the centerpiece, but in the last 20 years a diminutive version has become extremely popular with British Gypsies, who call these “Mini Vanners”. Americans breed up, therefore will breed the Classic Vanner up to a Grand Vanner. Gypsy Gold predicts that the Mini and Grand Vanners will become as popular as the Classic Vanners. 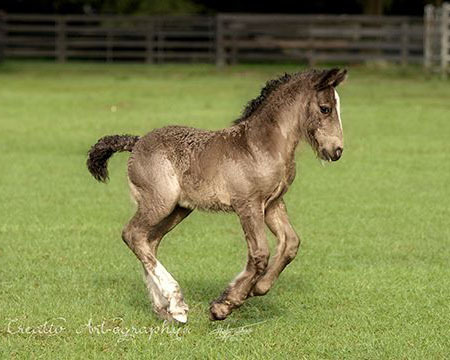 The key to maintaining the breed, no matter the size range you embrace, is a focus on the seven characteristics of the breed standard that define the Vanner breed. The Mini and Grand Vanner have developed from diminutive and grand offspring of the classic middle. The breed’s most precious genetics are in the middle, Poodles and Schnauzers developed this same way. It was clear from the beginning that the Classic size could be lost if it was not managed carefully, and that is why the original standard was established with sub names and size ranges like Schnauzers and Poodles. The size categories are Mini Vanner, Classic Vanner and Grand Vanner. Those names, along with their size ranges, were removed by a whimsical vote of a small group of uninformed society members. The society must correct that through its members before it’s too late. I deeply believe these things about sizes! The smaller and larger ranges must develop from genetics of the classic middle, British Gypsies know this and that is why their best little ones are carbon copies of their original larger size. The GVHS should document and supply mature height of each registered animal on their website. Example: Our stallion GG Versace is a mature 15.3 hands, but his sire and dam were 14.3, his grandsire on his dam’s side was 15h and so on. He comes from Classic genetics, but he wound up Grand. As a breeder, I must know this so that I can manage my breeding size goals going forward. If sizes are left to whimsically develop as they are now, the Classic Gypsy Vanner Horse that won the hearts of millions worldwide might well be lost in time, and that would be a sin. The only way to forever preserve the 14-15hh Classic Gypsy Vanner Horse is to celebrate and manage the upper and lower size ranges with sub names and informed breeders. Do you remember what a Quarter Horse used to look like? Manage the Vanner’s size and look to avoid the same outcome. Is a ‘drum horse’ just a bigger Vanner? No. 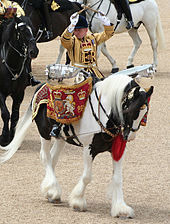 A drum horse is a horse the Queen of England chooses to carry drums in her parades. Throughout the years of research focused on understanding horses raised by British Gypsies, Cindy and I never heard of a Drum Horse. 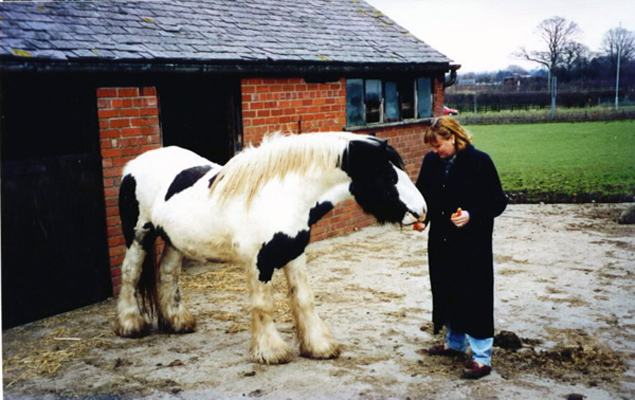 After the Vanner breed was introduced in 1998, an importer of Shire horses promoted that crossing a Shire stallion to a female horse raised by British Gypsies would produce a Drum Horse. Remember that 80% of the horses raised by British Gypsies in 1998 were not a breed. The promotion coincided with the release of a Drum Horse model by the Breyer Corporation and a total lack of knowledge concerning horses raised by British Gypsies by the American public, a perfect storm of sorts. Cindy and I were puzzled about the importer’s claim of a Drum Horse, so we called Fred Walker, a Gypsy friend often referred to as “the King of the coloured horses”. Fred knew everything about his breed. I asked Fred “What is a Drum Horse?” Fred said to me, “There are two things you need to know about Drum Horses. First, there is no genetic combination that will make one every time; and second there is no connection to horses raised by Gypsies other than possibly color.” The Queen chooses a large horse at random to carry drums in her parades. Even the contribution of color would not have come from the breed, it would have come from a crossbred horse, the breed is too small. This explained why we had never heard of a Drum Horse. The connection to the breed was manufactured for the purpose of selling horses, it is that simple. The British Drum Horse prior to 1998 was basically unknown to America, but lately due to crossbreeding with many Clydesdales and Shire mares, you can find a good number of Drum Horses that are offered for sale in the U.S. these days Indeed, the Drum Horse effort captured the imaginations of Americans and now, in addition to the Shire, includes the crossing of Clydesdales and Friesians with ‘Gypsy’ horses in an effort to produce an animal that looks like the Queen’s Drum Horse. The By-Laws of the Gypsy Vanner Horse Society dictate that crossbreeding is not allowed; the Shire Horse Society does not condone breeding Shire mares to anything but Shire stallions for the preservation of their breed; the Clydesdale is classified as ‘at risk’ by the Rare Breeds Survival Trust and The Friesian Horse association of America is strongly against crossbreeding Friesians. In conclusion, a Drum Horse has nothing to do with a breed of horse developed by British Gypsies and is therefore contrary to the mission and goals of the Gypsy Vanner Horse Society and Gypsy Gold. 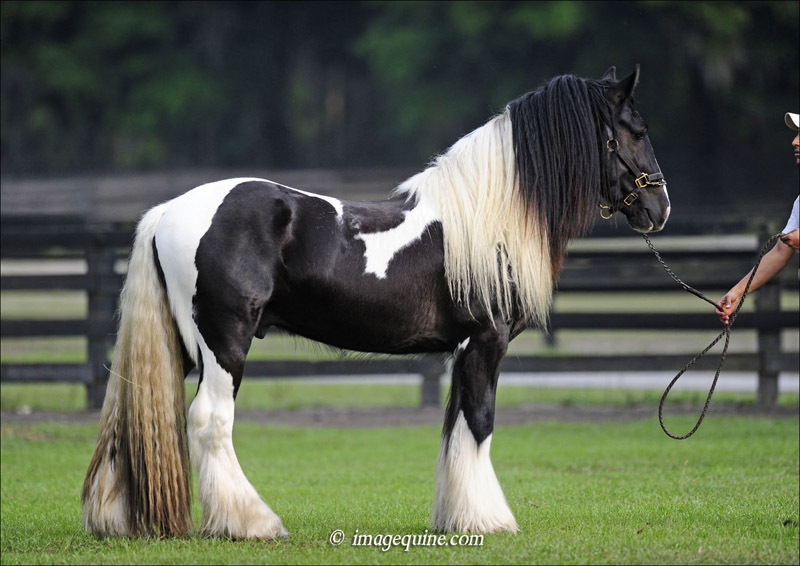 Why are the Gypsy Vanner Horses so expensive? The Gypsy Vanner Horse is a status symbol; the breed exactly as it was envisioned is actually less plentiful than one might think. In contrast, horses raised by Gypsies in general are not rare or expensive at all. To an untrained eye, they look similar, but they are genetically not the same. The breed makes your heart skip a beat, the less defined type does not. Exploitation and confusion about what the breed is on the Internet has made establishing the actual breed more difficult, and yes one could argue it has also made it easier. Tom had 1,500 horses when we met him. Most were not capable of evoking the special feeling he expressed about The Kent Horse because they were not his vision horses…his breed. Most of the 1,500 were called trade horses, knacker horses or, less often, colored riding horses. They are horses of unknown heritage with smooth legged genetics (often Connemara or Irish Draught), raised like cattle for the European meat market. Their look can fool you until you understand the breed’s intended look and the genetics that made it. Tom also had select mares of well known heritage and stallions he prized, The Old Horse of Wales and Bob The Blagdon are just two. Those horses were capable of creating the special look of his perfect caravan horse. Only Tom’s culture knew the breed’s vision horses from the type raised for the restaurant business until two Americans stumbled upon one stallion. Tom produced that colt/stallion by crossing The Old Horse of Wales with a Connors bred mare from Ireland. The colt was born on a hillside overlooking the Irish Sea and was named The Log. Tom said that to Dennis and Cindy Thompson overlooking the Irish Sea as they stood with The Log’s DNA verfied sire, The Old Horse of Wales. The Log grew up to be the highest priced colt in all of Great Britain, and was purchased as a yearling at Appleby Horse Fair by Roy Evans from Oswestry, England. A trade horse colt in the 90’s might cost $100 US or possibly less, but the special colt Tom raised and named The Log sold for $12,500 US as a yearling, also in the 90’s. The disparity in value is because one is a type with unknown heritage raised as a commodity, and one is of known heritage that will produce a specific look—a breed. The goals in establishing this breed are simple and all relate to not changing anything. 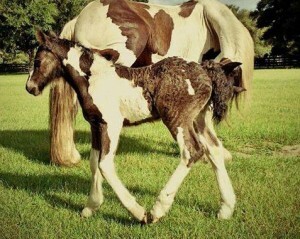 That means, establish the breed with the look British Gypsies envisioned, with the genetics that created the look, DNA verified whenever possible, with the feelings of status and pride like Tom felt for The Kent Horse, and establish the breed in direct parallel to the value Tom and Roy enjoyed for their special horses. We don’t have the right to stumble into a society uninvited and misinterpret, reinterpret, devalue or exploit the horses they hold so dear. Shame on us if we do. A commitment to remain culturally sensitive is in the breed’s mission statement and it requires that we strive to achieve the goal of parallel value. What does parallel value mean exactly? It means that one day you should be able to buy a Vanner baby directly from a British Gypsy breeder, get pictures of the baby’s sire and dam, along with DNA proof of heritage, and when your baby arrives in America, New Zealand or Brazil, with the exchange rates and import fees included, your investment will be in parallel to the established Value of the Vanner breed in your country. Throughout the 90’s, that meant $15,000 to $50,000 US. Take a moment and ponder how much sense parallel value makes for the British Gypsy culture and for breeders everywhere who want to embrace their breed without changing anything. By being sensitive to a culture, we establish breed integrity for them and for ourselves—win/win. Only integrity will establish and maintain the look, the genetics, the feelings and the value of the Vanner breed. Parallel value, while well intended, whets the appetite of exploitation. As the first Internet breed, the Vanner has experienced more than its share, driven by the worthy goal of parallel value. Think about it, if your focus is on personal gain and you can buy a trade horse foal for $100, import it for $7,500 and sell it for a huge profit, you would if your focus is personal! Anyone who imports large numbers of horses raised by British Gypsies is not focused on a breed, they are focused on personal gain. Breed integrity will prevail in the end, but not without a system that allows it to happen. Stay tuned. There was no passport system when the Vanner breed came to America, and there was approximately 2,000 horses worthy of breed status living in Great Britain. 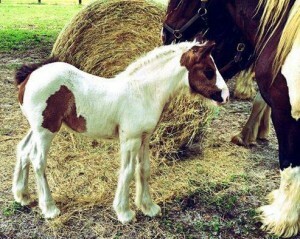 There was an additional 80% or 10,000 horses that are a non-breed type of colored horses raised by British Gypsies. Why on earth would someone own 1,500 horses unless there was a market to sell them? That’s why they are called “trade horses”, the restaurant trade is the “trade”. In recent years, the British Government enacted a passport system. Every horse in England must have a passport and the owner of the horse must declare that the animal will not be used for human consumption. Think about it—that means the 80% that were traditionally raised for human consumption will more profoundly be sold with the 20% that are a breed with an end result that is not good for the breed or type. Combine the new passport system with a poor economy and you get breed devaluation and lots of horses left to fend for themselves, with accusations of abuse. Sound familiar? Sometimes governments make decisions without fully understanding the subject or contemplating the impact of the decision. Bad decisions typically inspire good decisions, so we must have faith that all will be fine in time. Until then, “if you smell something, say something”. The exchange rate was 1.70 then and is only marginally different today. Import fees to America for horses under two years old is still $7,500. Mares over two years require two weeks of CEM quarantine, and stallions require four weeks or more. Minimum cost per day is $100 US, so add $1,500-2,000 for mare and $3,000-5,000 for stallions. Then add ground transport to your farm or to quarantine and then to your farm. If you leave average colts behind, as was the original intent, the math will result in a parallel value of $15,000-50,000 US. If you import average colts as geldings, those would be no less than $10,000 each, and none of the figures include a broker or the cost of actually seeing the horse before it’s purchased. Parallel value actually supports a breed’s domestic market while keeping a breed’s native market healthy. Make sense? That is why Gypsy Vanner Horses are so expensive! A powerful quote illustrates how meaningful a name can be. Names conjure up images and feelings both good and bad. Names should maintain a special feeling deliver the promise every time. Mercedes is a name that must deliver a feeling and promise or the name will be diminished. The name Gypsy Vanner horse is no different. As an international sales and marketing executive in the horse industry, I know the importance of delivering a name’s promise more than most. Until 1996, all horses raised by British Gypsies were called coloured horses or colored cobs. The names identified 100% of their horses, some a breed and many a type raised like cattle for the European meat market. Their breed needed a name that separated it from the type and a name that delivered a promise. Because of my international background in the horse industry, I knew the name “cob” to be confusing. It means one thing in America, another in Europe, another in Wales and is often described as a crossbred horse in international breed books. In my professional life, we made special tags for cob size products sold in Europe and North America, so the name “cob” was never considered. 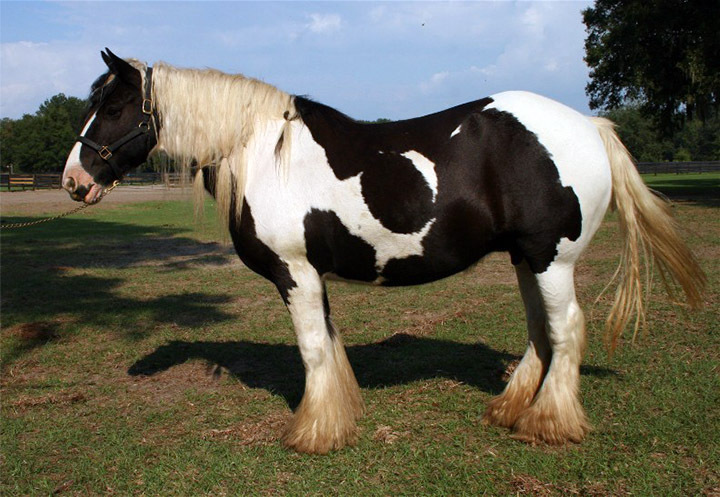 The story of Gypsy Gold and the Gypsy Vanner Horse is a story of two people’s obsession to understand British Gypsies and their horses and was born from the sighting of one special horse in 1995. The effort to understand was long, but gave us an understanding that may be unparalleled. It was an unbiased, non-prejudiced overview of British Gypsies and their horses that resulted in conclusions that even British Gypsies found fascinating. The task of choosing their breed’s name was more painful than can be imagined. It was a process of careful, deep and sensitive thought that seemed to go on forever. The choice was between Romany Horse and a name that Cindy surprised me with one day. Cindy saw a caption under a picture in a book titled “The Coloured Horse and Pony”, by English author Edward Hart. 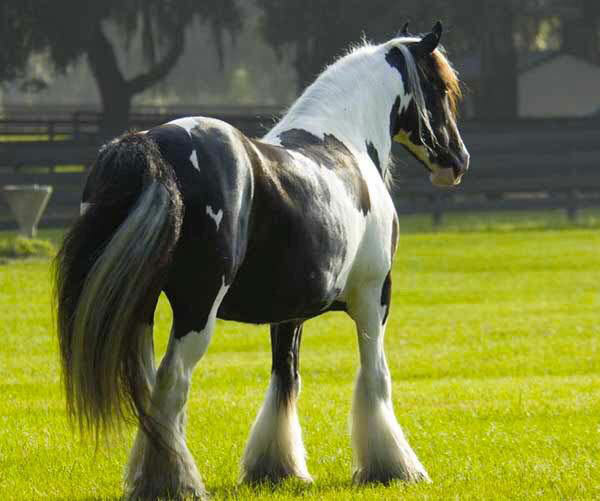 In a section he described as “The Gypsy type of colored horse,” Cindy noticed a caption under a picture that read, “the traditional Gypsy vanner”. Mr. Hart was simply using his English language to describe a horse raised by Gypsies, suitable to pull a caravan, but Cindy saw perfection. She sat me down with a twinkle in her eye and said, “Gypsy Vanner Horse”. I replied, “Neat name” and then woke up every night for the next two years. Were we bringing honor, recognition and a better understanding if we used a word that could be a cultural slur, “you gypped me?” I drove Cindy crazy until continuous deep thought and the words of one man brought the process to an end. In happened in three parts. Only one place in the world is the name Gypsy an umbrella term, and that is Great Britain. Compare the word “Gypsy” to other umbrella terms like American, European, Asian or Canadian. In Great Britain, there are people who live under the umbrella term called Rom or Romany, people called Irish and Scottish Travelers, people called Didikoi, people called New Age Travelers, people called Carnies and people who live a unique Gypsy lifestyle with no connection to genetics or history. Four out of six developed a breed, so Romany Horse excluded three out of four. The word Vanner once described a horse suitable to pull a caravan and was proper English. 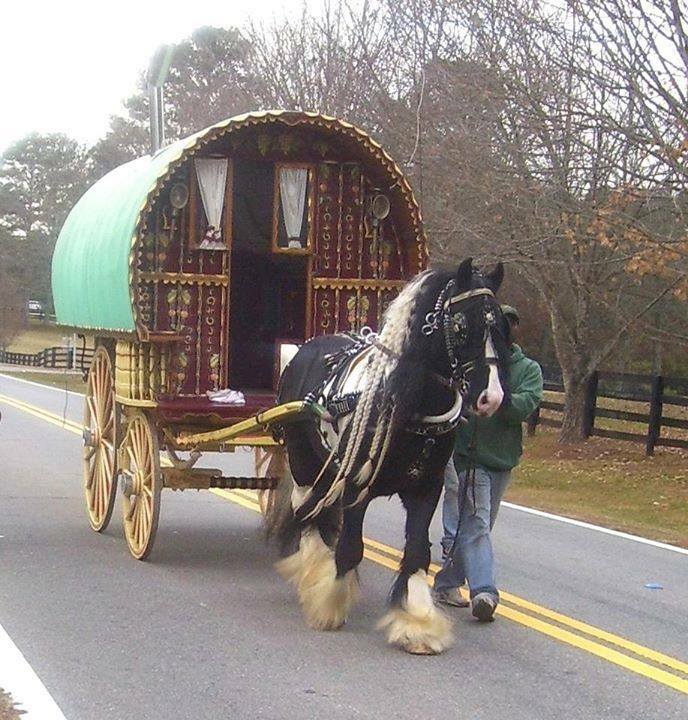 Vanner was described as “a horse suitable to pull a caravan” in the English Chambers Dictionary until it was removed in 1996 for lack of use. Vanners pulled all freight in Great Britain before combustable engines. Vanners were the semi trucks of yesteryear. 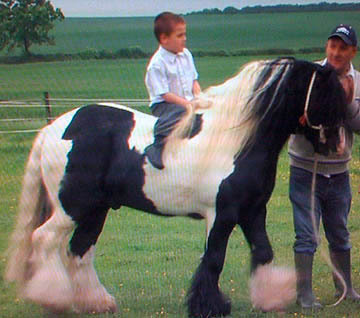 A Gypsy’s Vanner Horse is therefore a British Gypsy’s caravan horse. 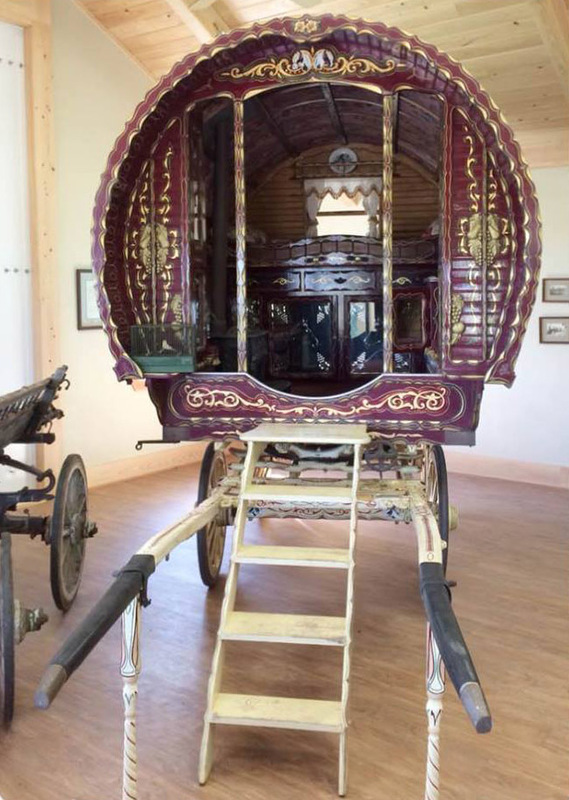 The inside of a Gypsy Caravan wagon imported to the U.S. by the Thompsons. Cindy and I flew back to England 60 days before the breed was introduced with the sole purpose of reviewing every detail of what we were about to expose publicly with the people who created the breed. In the process, we reviewed every detail and let them choose the name of their breed. The choices were made, but we had one breeder to go. Fred Walker, often referred to as “King of the Colored Horses”, maintained the same bloodlines from the time he was 19 years old until his death at the age of 78. Fred knew the stallions that inspired the breed, Sonny Mays and The Coal Horse, personally and Fred knew all the great stallions and mares that proceeded those stallions over the next half century. Fred became the best friend Cindy and I ever had. Fred called us every two weeks for years, sitting in a covered wagon on a cell phone. Fred would say, “I don’t drink and I don’t smoke, you are my vice, I spend my money on you.” I can hear Fred’s laughter now, he was a delight and a priceless source of breed knowledge. That day, the breed got a name and I got some sleep. 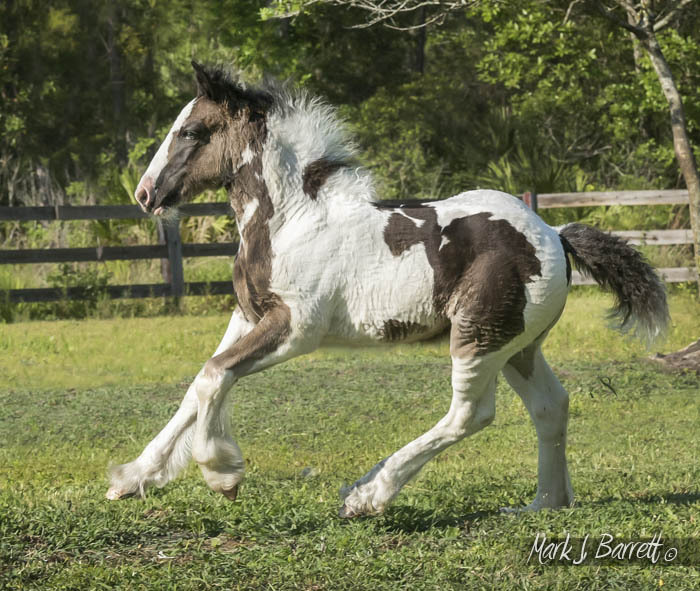 All names, different from Gypsy Vanner Horse, came after the breed’s introduction in 1998 and individuals not in harmony with the Gypsy Vanner Horse coined them all. For me, only one name will ever truly represent the breed, and it is Gypsy Vanner Horse. Cindy is gone now and I will follow one day. I can only hope that the Vanner vision is now shared by many to legitimately recognize a breed of horse developed by British Gypsies as a breed that will live on forever. As amazing as it may seem, the opportunity is still “All in a name”.